Half marathon training week 5 is in the books but not without some excitement and worry along the way. Here’s what happened. This is the fifth week of increased mileage and I think I reached my limit. By the end of the week my adductors were super tight and I was having flashbacks to injuring the same area back in April – which might explain my woe is me post last week. 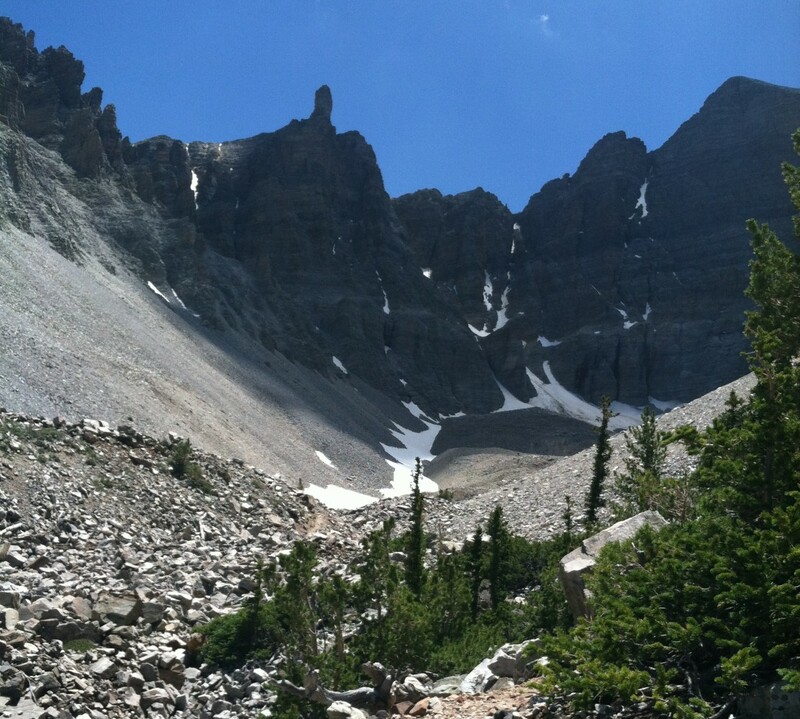 One highlight of our week was our second backpacking trip of the summer. We headed to the Uinta mountains to get away from the crazy heat here in SLC (104F no thank you). We started in Christmas Meadows and ended up at Kermsuh Lake – about 7 miles each way we a steepish section over a pass into the Kermsuh cirque. Perfect weather and beautiful scenery. Our burliest creek crossing – you can balance on the log in front or wuss it out on the logs behind. Sophie will not pose for pictures but had the cutest little backpack. The lake. The water was pretty darn cold – I just dipped my feet in but my husband went swimming. Luckily for me, I had a PT scheduled for Tuesday and it was kind of a mixed bag. But to explain why I need to tell you what exactly is wrong with me – and bear in mind I am not a medical professional but this is how I under stand it. Basically, I have severely limited range of motion in my left leg. My external rotation is abnormally bad – like call over other PTs to show them bad. When you run you need a balance of internal and external rotation to keep your leg straight. My leg wants to turn in and when it does the forces are unevenly distributed along my leg which means that some muscles are severely overloaded and this explains the muscle strains in this leg (calf x2 and adductor). To get everything back to normal we are working on increasing my range of motion (so that everything works as it is designed) mostly by trying to un-tighten my hips. It was pretty obvious in the first 5 minutes that all my hip stretching has not been working. My external rotation had not improved in two weeks. And along with the tightness in my adductors I was feeling pretty down, like I hadn’t improved and had even gotten worse. This isn’t really the case. I’ve been averaging about 20 miles per week for the last month or so, but it seems that 23ish miles with a 9 mile long runs is my sweet spot and we decided to plateau for a while until my symptoms disappear. So what do we do? Dry needling! I had this done before form my calf and it was not fun, but my PT was pretty hopeful that releasing my glute medius would help with stretching out those hips. So she stuck needles into three different spots in my glute medius – moved them around a bit and then electrically stimulated the muscle. And it felt really weird. Not painful but having your muscles involuntarily contract is the weirdest feeling – I honestly started laughing. And I think it worked. My rotation improved almost immediately and I have been feeling better during my runs and stretching routine. Fingers crossed! I’m planning on plateauing my mileage for the next couple of weeks which should be pretty easy because we are heading to Ireland and Belgium for vacation next week. It’ll be great to see family, get out of the heat and visit some beautiful sites. I probably won’t be commenting on blogs but you can follow the adventure on instagram. Week 4 is in the bag. Four days of running and the first time I’ve run over 20 miles a week in a long while. I’ll take it. But this doesn’t tell the full story. My running plan is approved by my PT. Increasing mileage 10% a week, including adding a mile to the long run per week. Nothing crazy. No speed work, no hill work – just building endurance. In fact, my PT is confident that everything is going well and that I should continue increasing mileage and generally keep doing what I’m doing. The problem is me. I was talking to her and almost waiting for her to tell me to dial things back. Things still haven’t clicked. My original injury has resolved itself but my left leg is still not quite right. No major pain just a little discomfort and probably a huge dose of paranoia. I mean a medical professional has told me that everything is fine – and a couple of aches as I’m getting my mileage up is totally normal and nothing to panic about, so why don’t I trust her? I think it’s mostly that I’ve lost some faith in my body. I’m running but having trouble imagining that I’ll ever get a new PR or have that smooth flowing feeling when running. I guess I just need to appreciate that it will come. But if anyone has any stories of successfully navigating a return to running and learning to trust that your body can get back to it’s best. Please share! So I guess I’m training for a half marathon? Hello again! It’s been a couple of weeks since my last post – and usually that is a bad thing. When my running is not going well I tend to avoid writing about it but not this time. I am happy to say that my running is actually going well and it turns out that I am on week 3 of a half marathon training program. Say what? When I last checked in I had completed my run-walk program and had completed my first 30 min run. The next couple of weeks were a little hit and miss. My pain in my leg was pretty low but I had a few things pop up that scared the bejaysus out of me: tight calves (always terrifying to someone who has strained their calf twice) and outer knee pain (also something I’ve dealt with before). Cue a couple of days of panic. But some stretching, rolling and religiously doing my PT exercises has resolved everything. Now I’m enjoying pain-free runs – well except that pain of being out of shape. This return to running has luckily coincided with the start of my half marathon training. I signed up for a race here in SLC on September 10th. My main goal is to get through the next 12 weeks in one piece and I’m pretty confident that will happen and I’m hoping that my PT will agree when I see her next week. My current plan is nothing crazy: run 4 (maybe up to 5) days a week. Right now my weekday runs are 3-4.5 miles and my first two long runs were 5 and 6 miles respectively. All at easy paces. No speedwork. I’m aiming to increase distance 10% per week and I know from experience that increasing distance with speedwork just does not work with my body. The highlights (besides being pain-free) were those longer runs – I cannot wait to get out and spend some time out on the road and managing two days in a row. This wasn’t ideal but we spent Saturday and Sunday hiking in the Uintas (a mountain range about 1.5 hours from SLC). This meant a 8.5 mile hike in and a night spent camping by one of the many lakes (Baynes lake I think). So much cooler (in the 60s) with beautiful scenery (just in case you thought Utah was all desert) but so many mosquitos. It was great to get away from it all but a rude awakening to carry a backpack on mountain trails – the whole time we were at 10000ft. And the best part: my legs were just fine. Tired feet and sore hips from carrying 30lbs (you gotta have some backpacking wine!) but those legs – I think they might be back to normal.